ORANGE WALK–After receiving the disappointing news that sugar conglomerate Tate & Lyle Industries will probably only be buying a minimum of 10,000 tons of Fair-trade sugar from local cane farmers for the next sugar crop season, the Belize Sugar Cane Farmers Association (BSCFA), which has been having an uncomfortable couple of weeks, got some auspicious news this week when they were informed that the London-based sugar corporation will not only acquire the original quota of 65,000 tons of sugar for the 2013-2014 crop season, but payment will also be effective immediately for that specific crop. 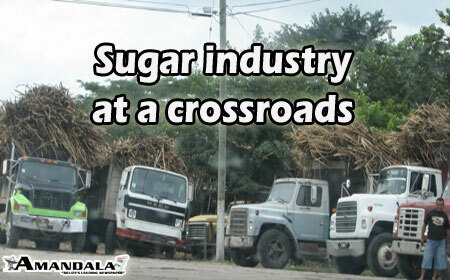 BSCFA spokesperson, Alfredo Ortega, explained the details of the letter to the media, and he emphasized that in the near future, the association plans to lobby for cañeros to get a better figure in terms of sugar payments. Ortega also mentioned that in the meanwhile, the BSCFA will be closely monitoring the situation to hopefully increase and stabilize the grim projected 10,000-ton quota by the time the next season’s crop is ready for harvest. “That is likely to have a potential negative impact on the farmers and the association because we don’t know what will be their [payment] scheme, so we will also be demonstrating to them how this will really harm the organization, not only in the social projects, but also in compliance to the Fair-trade agreement. We will lobby with them to see how best we can have an increase to more than just the 10,000 [tons] because the more we can get, the more we can invest into the [social welfare] programs and give more assistance to the farmers. They said, in the letter, that as soon as they can finalize the payment scheme in which they will be addressing the sugar quota for all countries [which they buy from] next year, they will send us a copy of that. So we need to wait until we see what the payment scheme is that they will be implementing next year,” he said. According to Ortega, plans are in the works to meet with representatives of Tate & Lyle shortly to see how best this latest situation can be worked out for the benefit of the farmers and the industry at large. It is noteworthy to mention that Tate & Lyle will continue to buy Belize’s sugar, and that it is only the 65,000-ton portion sold under the Fair-trade logo, for which the cañeros receive a Fair-trade premium price, that will quite possibly be slashed.